I unleashed a volley of obscenities at the two (two!) cars parked in the middle of the bike lane. After a minor fender-bender, these two drivers decided the best course of action was to move their cars into the protected bike lane of 15th, thus forcing people on bikes (me!) into traffic. I cursed; they cursed back. At the next light, a woman on a bike pulled up next to me. “That wasn’t helpful,” she said. “But,” I started, thinking of all the different ways the bike lane is blocked daily by cars, construction and utility companies determined to dig up every bit of asphalt in this city. However, I’ll admit when I’m wrong and I was. Yelling at them did not help matters nor did it make me feel better. It just left me with a hangover of rage. It’s a tough time of year. I dread these days when the sun sinks lower in the sky until it just barely seems to get above the horizon. You go to work under gray skies and leave when it’s black. A time of deep crankiness, when schedules are packed with commitments while you’re pressed with a tyrannical demand to appear jolly. Humans, however, are cyclical animals and this is the low end of the year, a sputtering conclusion to a particularly bad one. Thank god I can run. On Monday, after wrestling with “Run? 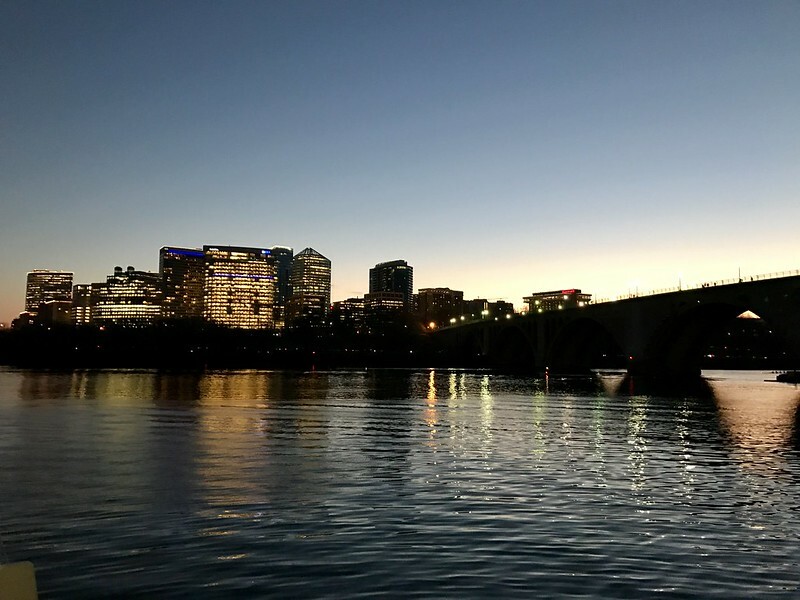 Don’t run?” I plodded toward Georgetown as the sun set. Running along the waterfront it occurred to me that perhaps the way to conquer winter was to embrace the darkness. Cold temps bring a stillness to the city, banishing the fair-weather tourists. I ran alone by the dark Potomac. Light lingered in the west, across the river. I stopped to capture the moment. Pretty photo but I’m never going to love winter. Move faster, earth, and spin these dark days away until we reach spring.